Based on the legendary 1988 film, starring Michael Caine and Steve Martin, DIRTY ROTTEN SCOUNDRELS is the latest musical to grace the stage of the Bristol Hippodrome. Doors opened last night with Michael Praed (best known for his TV roles including ‘Robin Hood’ in “Robin of Sherwood”) playing sophisticated scoundrel Lawrence Jameson, Noel Sullivan (member of British pop group Hear’Say) enjoying the amusing role of uncouth conman Freddy Benson and Carley Stenson (Steph Cunningham from Hollyoaks) as their beautiful love interest. Gary Wilmot (who we recently saw playing ‘Ali Hakim’ in the UK tour of “Oklahoma!”) plays crooked chief of police Andre Thibault while Geraldine Fitzgerald (TV’s Soldier Soldier) plays wealthy and gullible Muriel Eubanks. We’re transported to the luxurious lap of the French Riviera where the decadent world of sophisticated conman Lawrence Jameson is set to come crashing down with the arrival of larger-than-life Freddy Benson – a conman of an entirely different order. Soon realising the town ain’t big enough for the both of them, the two find themselves going head to head in the con of their lives, pulling out all of the stops in a bid for the affections of millionaire soap heiress Christine Colgate. Little do they know what they’ve let themselves in for. The set is simple and classy, offering a feeling of space with floor to ceiling height curtains and doors showing off Lawrence’s ill gotten wealth. Props glide gracefully in and out and I’m particularly impressed by the swift appearance of a first class railway dining carriage. Costumes are glamorous with ladies dancing in sparkly gowns, gentlemen in dinner jackets, bellboys in smart red and gold uniforms. Choreography is interesting, dancing beautifully executed and the band superb. If you were to cut out the odd scene here and there, the show could be quite family friendly, but there are sections which are majorly inappropriate for children. A few maids in skimpy outfits, showing more of their bottoms than is usual in polite company, is the least of my worries! The scene where Freddy poses as Lawrence’s repulsive brother Ruprecht includes references to KY Jelly and features Freddy eating one of their pet fish. The language is gratuitously vulgar in places, there are lots of sexual references and the boys don’t find the story easy to follow until I clarify it during the interval. I’d say it’s considerably too old for my eleven year old to get completely and I don’t think I’d want to take him back until he’s at least thirteen, or maybe even a little older. Despite my reservations about age appropriateness, the boys enjoy it, although I’m not certain why. They find the con-artist storyline difficult to follow and there are no tricks, gimmicks or acrobatics to wow them. What I think makes it for them is the humour, particularly the scenes featuring the character I knew would be their favourite, Freddy. Sullivan excels in this fun role with his strong singing, coupled with the ability to slide easily and convincingly into several varied character roles. Carley Stenson delivers a wonderful performance in her role as the elegant, beautiful, clever Christine Colgate. Praed is convincing as the successful, vain con artist and Phoebe Coupe plays the part of his irritating ‘fiancee’ Jolene Oakes beautifully annoyingly. In a sideshow to the main story, Gary Wilmot and Geraldine Fitzgerald make a commanding double act with a nod to charming musical theatre comedy of a bygone era. Christine and Freddy’s comic scenes are a highlight for our group and are also those appreciated most by pretty much the whole audience, it seems. There’s a distinct pause in the action during one scene, when raucous audience laughter infects the stage and poor Noel and Carly have to visibly stifle their own giggles before managing to go on to deliver their next lines. 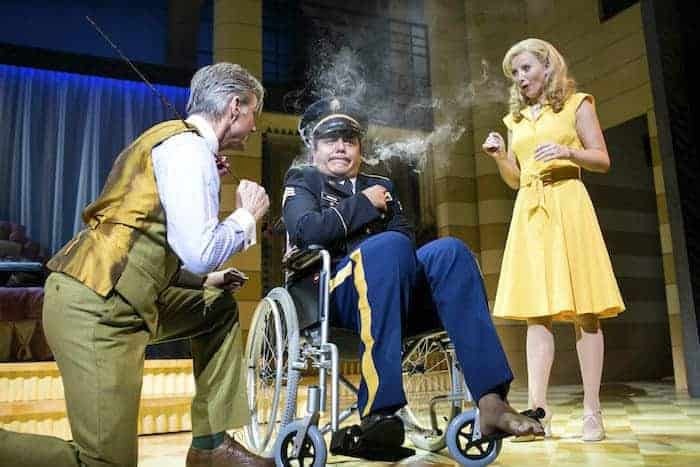 I have mixed feelings about Dirty Rotten Scoundrels The Musical. I haven’t seen the show before and I’m not familiar with the storyline so I’m taking what I see at face value, but it seems a strange choice to transport from screen to stage. To be honest, I found parts of it quite tedious, but then there are good bits which were well worth waiting for. The storyline is quite clever and not overly predictable with humour which builds over time, culminating in moments of laughing out loud. I leave the theatre on a high. Enjoyed our Dirty Rotten Scoundrels review ? Then why not check out other show reviews on Practically Perfect Mums? I love musicals! I didn’t know that Gary Wilmot was starring in musicals now. Next post: Farewell Dismaland. Can we Have Our Lido Back Now Please?